This entry was posted on January 9, 2015 by Jessica Anderson. Why do people give and get awards? Being in business since 1986, we’ve seen many corporate awards go through our doors - creating these awards is our specialty. Below are some general trends we've seen as to why organizations present awards. 1. Accomplishment. People and organizations earn awards for reaching and exceeding goals, especially for sales and other contests. The Best of the Best get noticed and recognized. 2. Service. An award provides a way to show appreciation for service to an organization. Multiple years of employment at a company, being an outstanding customer or vendor, or serving on a Board of Directors deserves recognition. 3. Special Life Moments. Many people receive awards during life transitions, including changing employment or retiring. 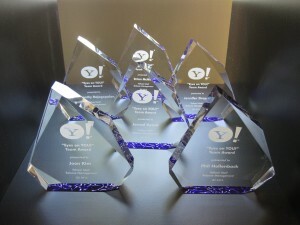 We also see awards as personalized gifts for weddings, anniversaries, and remembrances. 4. Gratitude. If a person helps an organization or volunteers for a cause, many times they will be thanked for their efforts. An award is a tangible reminder of this gratitude. Organizations show their appreciation to outstanding individuals who go above and beyond by honoring them with personalized awards. 5. Team Building. Many corporate customers choose more casual awards for their staff, including joke awards, trophies that coordinate with a contest theme, or one of a kind custom awards tailored to their specific event. We’d love to hear why your organization gives awards! Email me your story at [email protected]; include a picture and I'll share it on our Facebook Page!